Julian and Joshua both love to sleep on their Daddy. Joshua David Freyer and Julian Daniel Freyer. Brothers. Twins. The same, but different. The boys turned 1 last month! So now they are both on the cusp between infants and toddlers. Both pull up on furniture and walk along, but neither seem interested in walking freely yet. Joshua has taken a few steps but still prefers crawling. They both enjoy playing with their tunnel, toy car, and rocking/rolling horse. Julian and Joshua in their tunnel. The most noticeable difference between them continues to be their hair -- not just color but now texture too. Julian's light brown/sandy blonde hair is strait and fine. It sticks up in places and has earned him the affectionate nickname of Fuzzhead from my mom. Grammy sometimes calls Joshua Red, and his hair is shorter and thicker than Julian's and is starting to curl. They both have a lot to say and babble all day long. Neither have had a true first word, but there seems to be some meaning to them saying mamama and dadada. Twins are often a bit delayed with language development until they start school because they reinforce each other's babble. One way children learn language is through books, and both boys love books (which warms my librarian heart)! They will sit on their own and flip through pages or bring books to you so you can read them together. 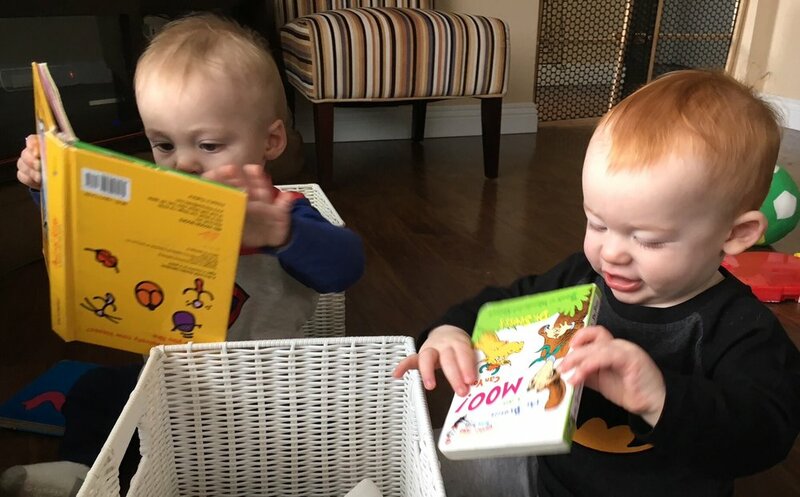 Julian and Joshua love books even if they're upside down. The other day Jason said to me that the big difference between our sons can be summed up in how they each play with a box. When given a box, Julian will sit inside of it whereas Joshua will turn it over and sit on top of it. Both love boxes, but they play with them in their own way. The same, but different.